I can’t quite put into words my reasons for adoring “The Great British Bake-Off” while simultaneously being completely turned off by most American cooking competition shows. Maybe it has something to do with the bad taste I still have in my mouth from the Food Network taking the original cooking competition show – “Iron Chef” – a classic, reverent celebration of the talent and creativity of some of Asia’s best chefs, and turning it into a totally American-style Wild West shootout of food: over the top, loud and formulaic. I got hooked on “The Great British Bake-Off” a few years ago, when I discovered the Hola app for Google Chrome. (Hola allows those outside the UK to watch BBC shows online.) The show does follow a formula. Each episode focuses on a particular aspect of baking (i.e. pastry, cakes, biscuits – cookies for the non-Brits, alternative ingredients – gluten-free, sugar-free, etc.). Competitors from around Britain initially participate in the Signature Challenge, an opportunity for them to create a bake that showcases their own talents and techniques, perhaps making an item they prepare at home for their family and friends. The bake is timed and judged, then the contestants move on to the Technical Challenge, a bake for which all participants are given the same ingredient list, but with no instructions. They must use their own knowledge of baking techniques to combine the ingredients properly and accomplish a bake that most closely matches the example provided by the judges. Again, bakes are timed and judged. The final challenge each week is the Showstopper Challenge, a go-big-or-go-home occasion for the bakers to let their creativity run wild. Given a theme, each contestant must do their best to wow the judges with the appearance, taste and complexity of their bake. 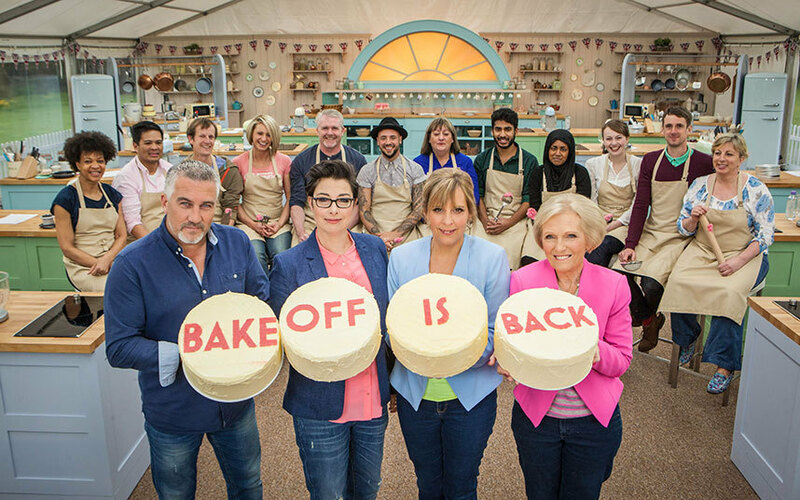 At the end of the three bakes, a Star Baker is chosen and the contestant chosen by the judges as the least skilled is sent home. Judging the bakes each week are cookbook author Mary Berry and professional baker Paul Hollywood. Presenters – more like color commentators – Mel Giedroyc and Sue Perkins add a soothing running commentary to the festivities. Rather than yelling and running around like lunatics (as I’m sure would be the case if this show were on American television), the coverage of the activities in the GBBO tent have a certain civility without losing the importance of standout techniques or unfortunate mistakes. The BAFTA-winning British show has gone over so well that it has spawned a slew of international versions, from Australia to South Africa to Ireland to Turkey. As a French speaker and Francophile, the French version, “Le Meilleur Patissier,” is another favorite of mine. A short-lived American version featuring host Jeff Foxworthy, original GBBO judge Paul Hollywood and judge Marcella Valladolid (of Food Network series “Mexican Made Easy”) aired in the Spring of 2013, but it was bumped to a new time slot to make way for Big Brother and, going head to head with Fox’s “Master Chef” died a slow, painful death. The original is still the best though, IMHO. If you have an interest in baking, download the Hola app for Google Chrome and check it out on BBC. 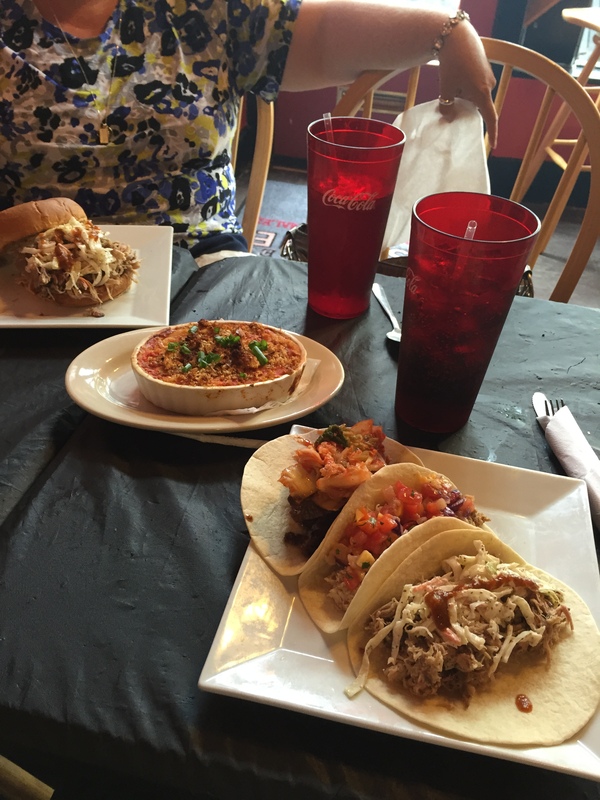 Local Barbecue, Tacos and Beer – The Cultured Swine and Isley Brewing Co. 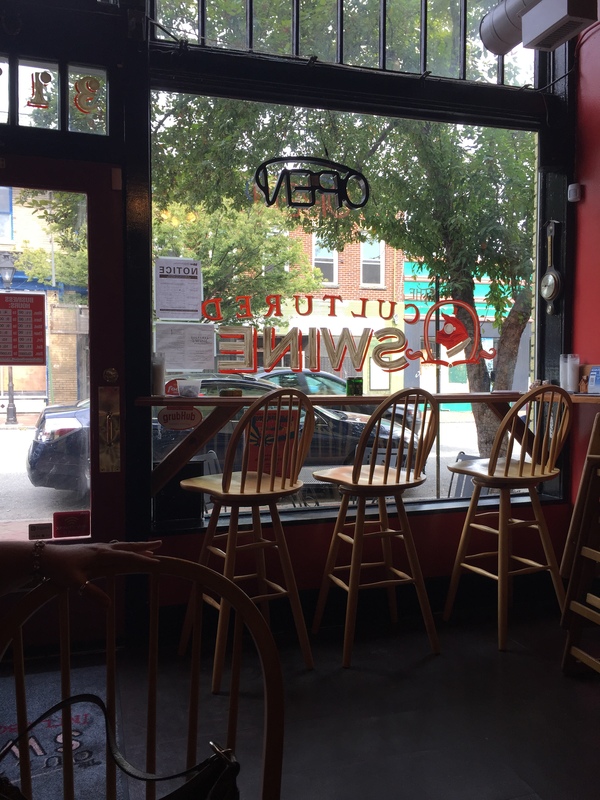 The Cultured Swine, located in the midst of the burgeoning Jackson Ward restaurant scene, offers tacos, sandwiches, tamales and sides that marry the flavors of Mexico, Korea and Jamaica with barbecue. It might sound strange, but it works. I tried the taco trio of the Tarheel Special (NC-style pulled pork barbecue with “swine sauce” and cole slaw), the Big Jerk (Jamaican jerk chicken with mango pico de gallo) and the Go Go Gogi (Korean-style beef with kimchi salsa). My lunch pal had the Tarheel Special barbecue sandwich, and we shared a side of Riri’s Macaroni Pie. Inspired by Rihanna, the macaroni pie was topped with crushed tomatoes and breadcrumbs and made a crunchy, spicy addition to our meal. My three tacos were awesome. My favorite was the Big Jerk – the mango pico de gallo was the perfect accompaniment to the heat of the chicken. The Go Go Gogi was sweet and spicy, and the Tarheel Special had perfectly-smoked pork with crisp, tangy coleslaw and homemade barbecue sauce. The spot itself is tucked away on a side street just down from Saison. They’re open for lunch and dinner. 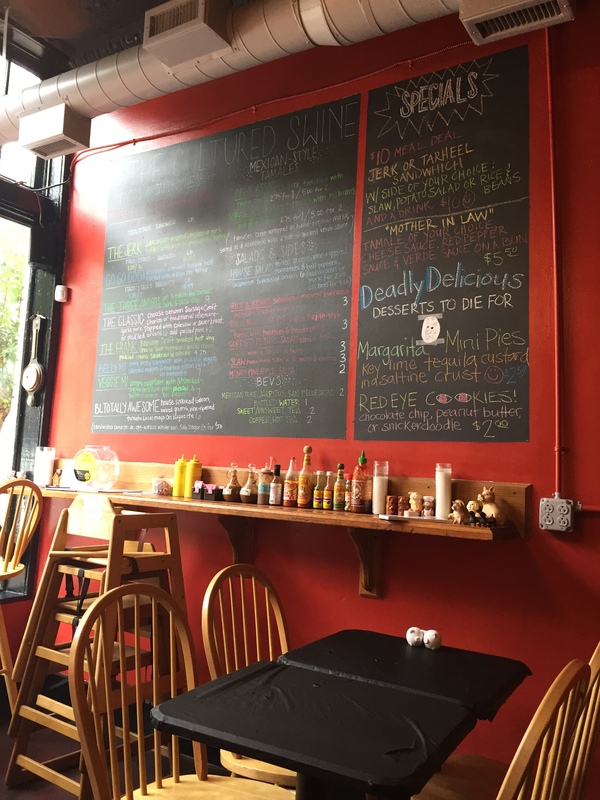 Their food was delicious – I can’t wait to go back! My husband and I got a rare Friday evening together sans kids, and we headed to Isley Brewing Co. for happy hour and some beer flights. I’d tried their Choosy Mother peanut butter porter at Growlers to Go, so I knew they made some interesting beers. 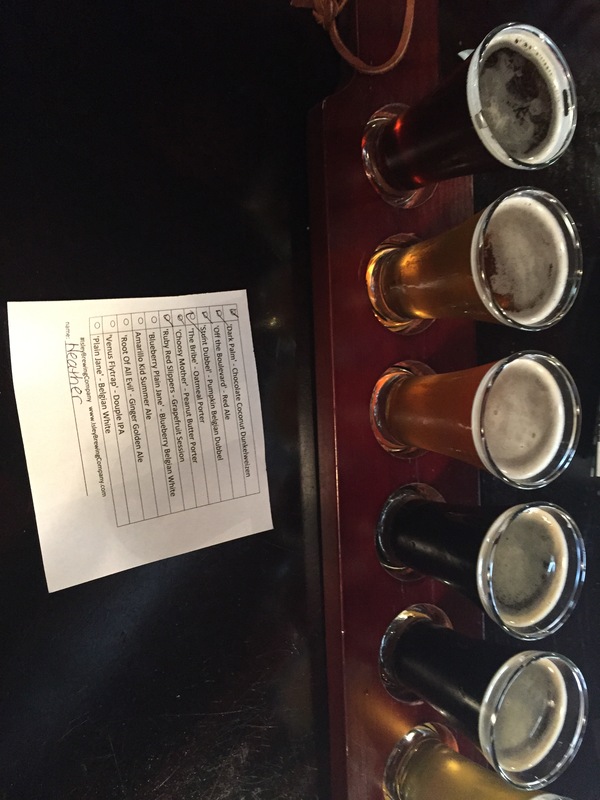 I was not disappointed my my flight choices of Dark Palm (chocolate coconut dunkelweizen), Off the Boulevard red ale, Stunt Dubbel (pumpkin Belgian dubbel), Choosy Mother peanut butter porter (yes, I had to have it again!) and Ruby Red Slippers (grapefruit session). I am a super fan of the Choosy Mother peanut butter porter. I love dark beer, and I love peanut butter. The combination was magical! The Dark Palm was interesting, but seemed a little like a failed experiment (hence the marked down price of $3 a pint), but the Stunt Dubbel was amazing enough to be a new favorite pumpkin beer, and the Ruby Red Slippers was a crisp, refreshing late summer brew. Complimentary Cape Cod chips and Snyder’s pretzels are available. The brewery and tasting room are located in Scott’s Addition. The space is sleek but comfortable, with a mix of bar space, tables and sofas/chairs to relax in. Happy hour (4-6 pm) offers $1 off all beers, and there are food trucks and special events too. If you’re in Richmond and fan of barbecue, tacos and beer, you’ve gotta check out The Cultured Swine and Isley Brewing Co.!